AppAudioConfig is a free portable software for Microsoft Windows devices that you may use to control the audio volume of individual Windows programs. Microsoft integrated program-specific sound volumes in Windows Vista. The feature allows Windows users to set the volume of sound for programs running on the device individually. The company's newest operating system Windows 10 lacked options to control app volume individually on launch by default but Microsoft integrated the functionality in the Anniversary Update feature edition. You can use it to turn up the volume of a music player, mute a web browser, or make sure that computer games are not too loud. While Windows users can use native volume controls for that, a right-click on the volume icon and the selection of Volume Mixer is all that is required, it may be easier to use a third-party program for that instead. AppAudioConfig is a new Nirsoft application that you may use to control the sound volume of individual processes on the system you run it on. The program is offered as a 32-bit and 64-bit version, and it is compatible with all versions of Windows starting with Windows Vista. AppAudioConfig is portable which means that you can run it directly after you have downloaded the archive to the local system and extracted it. The program lists all running processes which can tap into audio in its interface on start. Each process is listed with its name and path, and sound settings. You find the volume listed there, the state of the device, mute status and more. One of the advantages of AppAudioConfig is that it provides a better overview of all processes and their states. Right-click on any process to display the context menu with options to change the volume or mute status. Note that you can select multiple processes and change their volume or state in a single operation; another advantage over the built-in Volume Mixer of the Windows operating system. You can use it to mute all processes at once, or turn down the volume of them all. You may use keyboard shortcuts to control the volume and mute status as well. Tap on F2 to control the volume and use F7/F8 to mute/unmute. AppAudioConfig supports multiple sound devices and displays them in its interface so that you may control volume and mute status of processes for each recognized sound device individually. The volume configuration displays options to set the application volume and, optionally, the audio balance as well. The app stores the changed settings in the Registry under HKEY_CURRENT_USER\Software\Microsoft\Internet Explorer\LowRegistry\Audio\PolicyConfig\PropertyStore so that they are honored by Windows even when AppAudioConfig is not running. AppAudioConfig is a useful portable program for Windows to better (faster) manage the volume and mute status of programs on PCs running Windows. The option to control the volume for multiple programs at once, support for different sound devices, and better overview of available processes may make it interesting to some users. 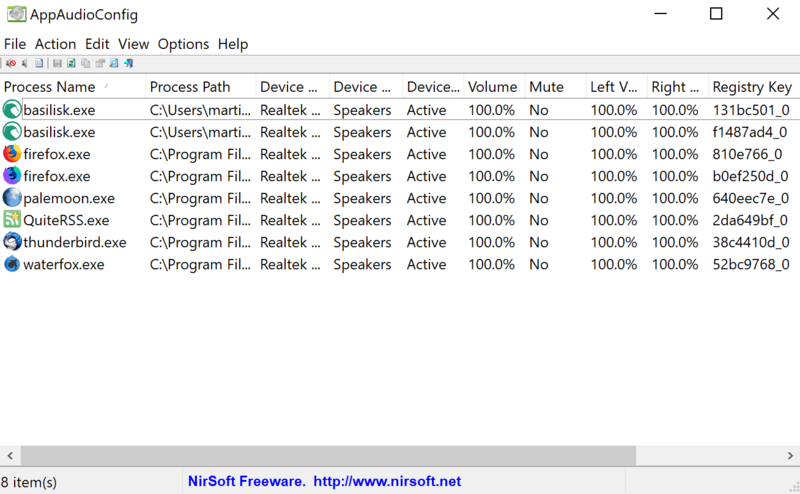 Nirsoft's Sound Volume View may be another useful program that Windows users may add to their arsenal of tools. It supports the creation of sound profiles to quickly switch between them on Windows machines. 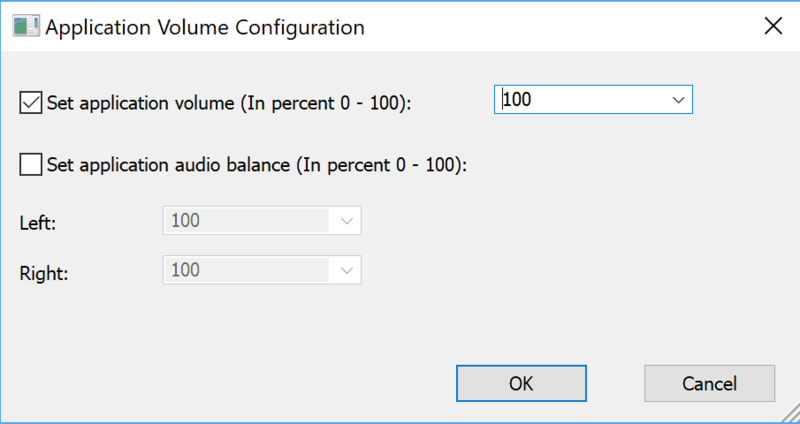 Now You: Do you use custom volume settings for individual programs? I use eartrumpet, that achieves almost the same results, but with a much better interface. Very useful program. I also found so many orphaned paths, I removed them. While I am annoyed different programs output different sound levels, I hesitate to try to administer control with yet another application to be learned and updated. My ASUS laptop has a function key along with F10, F11, and F12 to mute, decrease, or increase volume incrementally. It is simple and fast to fix whatever occasional volume annoyance I experience. 3rd party programs the merely duplicate built in OS functions are useless. Certain programs are always too loud or too soft on the volume. Does this program remember your adjustments for specific programs, so that the next time you start the program, its’ volume is automatically set to the level you want? That would be a real useful feature! Otherwise, this just duplicates what the OS provides already. It’s not clear from this review if this program offers this feature.